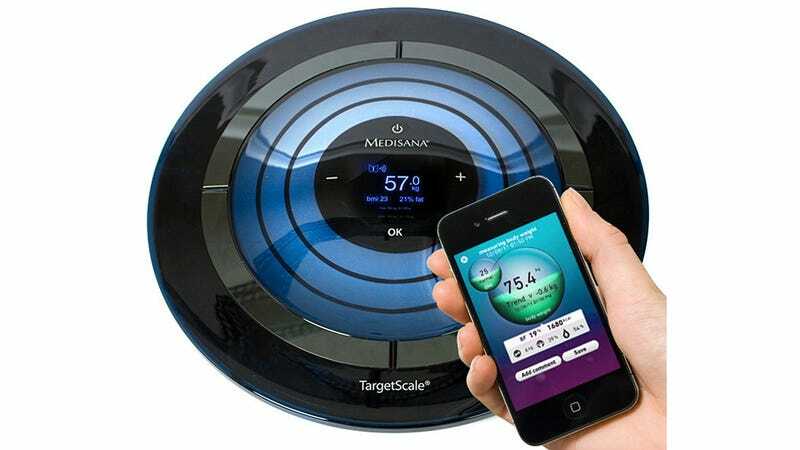 Medisana's TargetScale is another wireless weight-monitoring solution that reports back to a smartphone so you can better track your progress. But its real appeal is a set of animated glowing rings that will make your bathroom feel like Captain Kirk's most private quarters. Using the accompanying free VitaDock app on your iOS device you can track and analyze your weight loss over time as you work towards your goal. But that's functionality we've seen before. What makes the TargetScale most appealing is its ability to also determine your body mass index, your body's fat and water content, and even its muscle and bone mass. In fact it will track this for up to four different users, even if they don't have an iPhone to sync it too. It can also perform a balance test to determine the distribution of weight on each foot, but we're most enamored by the $200+ scale's glowing concentric rings.